With its handsome red, white, and blue embossed cover, Little Brown Publishing's AMERICA: The Making of a Nation is impossible to resist picking up and paging through. I found this tattered suitcase in the dusty corner of my attic. I don't know who left it there, but I when opened it and began to read the journal inside. I knew how very special it was. I spent hours sifting through all of the mementos and treasures collected. What I discovered was not only the story of one man's life and experiences, but also the events and pioneering spirit that led to the making of a great nation. Enjoy this special glimpse back into history, past and present. Remember that it belongs to each one of us--it is the history of America. Inside the book opens into a double-page collage of Americana--the back of a two-dollar bill showing John Trumball's painting of the signing of the Declaration of Independence, a Kennedy campaign logo, a ticket for the transcontinental railroad, an eagle feather, an Apollo 11 patch--and a fold-out copy of the personal journal which Charlie finds in that old valise. The following page shows a collage of souvenirs which the journal's creator collected when invited with his World War II comrades to a White House dinner. Affixed flap books--a White House Souvenir Pocket Guide, a lift-the-flap facsimile postcard of the Washington Monument mailed from Washington--all on a pastiche of informational sources about the nation's capital, teach the reader about that historic place. Another double-page collage of historic American music features a lift-out facsimile of nineteenth-century sheet music for The Star Spangled Banner, which slips inside a collage of 78 rpm records of Old Man River (who knew Judy Garland recorded this one?) and This Land Is Your Land (ditto for Bruce Springsteen! ), and a multi-fold pull-out with all the verses for the "patriotic songs" Stars and Stripes Forever, Oh, Shenandoah, and America The Beautiful. Other pages offer flaps containing a half-page die-cut flap of the Mount Rushmore figures, backed by a list of the presidents and their terms, as well as symbols of the nation, a Union & Central Pacific Railroad ticket, postcards from Monument Valley and Niagara Falls, an "Inspection Card" for immigrants passing through Ellis Island, and a sealed envelope with an impressive replica of the Declaration of Independence. Each double-page spread provides a collage of information arranged by theme--"From Sea to Shining Sea" (maps and historic destinations), "Welcome to America," (the Statue of Liberty, a skyscraper-themed bar graph of the waves of immigration by country of origin), and "Words to Make a Nation," (noted quotations from all eras). One striking spread features a timeline of America laid out as tree rings on a cross-section of a "Liberty Tree." 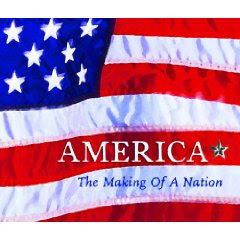 Not at all a history textbook, AMERICA: The Making of a Nation is a browsing book in the best sense of the word, a book which inspires interest and reinforces classroom knowledge as the reader follows the fictional journal writer through his lifelong discovery of America's places, people, and spirit. Sturdy enough for libraries and striking enough for a coffee-table book, this one is a beauty at a bargain price.